Posted on November 16th 2011 at 9:29am in My Life, The World. “No thank you” I said as I unzipped my rucksack. At least she looked slightly embarrassed as I took everything out of the carrier bag she’d put them into and transferred them to the rucksack. Posted on October 23rd 2011 at 10:53am in Media, Sport, TV. I’m really not sure that the script writers for Season 7 of Rugby World Cup have done a very good job. They’ve continued the habit from previous seasons of writing out fan favourite characters such as Tonga or Wales before the finale, and have decided that the season finale would be a rematch of the one from season one. So what have they added that’s new? Well, in terms of character development, previous seasons have hinted towards France’s mental instability but this season the writers flirted with pushing them over the edge into insanity. But then the went and bottled it and failed to follow through on this development in the finale itself. Deciding the make the England character the focus of multi-media spin-offs rather than a core part of the series itself was an odd way to treat a character with such a large fan base and which had been such an integral part of previous seasons. The running gag about New Zealand fly halves is in rather poor taste and is just ripping off Spinal Tap anyway. And the gag about no one at all being able to kick straight is rather clumsy attempt on the writers’ part to counter criticism of too much kicking in previous seasons. The finale itself was a rather scrappy affair, almost as if there wasn’t enough budget left for any spectacular special effects sequences. I can’t tell whether having the teams play in black and white was supposed to be some sort of post-modernist statement or not. All in all not a classic season, but I kept on watching anyway so they must have done something right. I just hope the writing team has some fresh ideas for Season 8. Posted on July 17th 2011 at 7:37pm in The World. She had sunglasses perched atop masses of curly blonde hair. She wore a full length blue dress that was cut low at the front to reveal a very small dog nestled contentedly in the cleavage of her rather ample bosom. She was wandering round the One-Stop, looking for the wine, chattering constantly to herself, her mate and her dog. Posted on May 23rd 2011 at 1:03pm in Blogs, Books, My Life, Work. 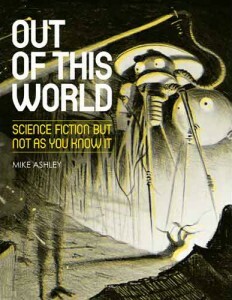 Last Thursday evening I attended the launch of the Out of this World science fiction exhibition at the British Library. I’ve blogged about the exhibition for work. The launch night was fun in a peculiarly geeky way as I got to play spot the author/critic/BNF. Some people (Kim Newman to give the obvious example) are easy to spot but far too many fall into the general category of middle aged men with greying beards. In fact I could easily have been looking at the crowd at Salute or @media instead. At the same time that I was listening to China Miéville give a speech to open the show, Lettice was at a different exhibition launch with Cilla Black and Ringo Star. There’s probably something profound in that contrast but I’m really not sure what. Posted on May 5th 2011 at 7:59pm in My Life, The World. I’ve just voted. If you haven’t already done likewise, you have two hours left to do so. I don’t think that AV is a great system – it’s no more proportional than FPTP. But it’s what’s on offer and it is slightly better than FPTP in two respects. It helps to mitigate a situation where a candidate is elected to whom the majority of the electorate are opposed. e.g. a Labour candidate getting elected because the right wing majority in the constituency is split between UKIP and Conseratives. MPs that are at least tolerable to the majority of their constituents must be a good thing. And it helps us to more accurately judge the support for medium and small parties. Under FPTP many people don’t vote Green, etc., because they see it as a wasted vote, and hence we have no idea how widespread the real support for these parties is. Better knowledge about what people really support must be a good thing. I think we’re going to lose, and that we’ll be stuck with FPTP and (with a Lib-Dem collapse likely) a strengthened two party system for another generation. That seems like a bad thing. Posted on April 11th 2011 at 5:14pm in Media, My Life. On Friday Lettice and I saw Frankenstein at the National Theatre. As the leads are alternating the roles we saw it with Jonny Lee Miller as Victor Frankenstein and Benedict Cumberbatch as the creature. This adaptation drops the novel’s framing device and everything leading up to the moment when the creature is shocked into life, hence the play began with ten minutes of naked Benedict Cumberbatch (hello everyone who arrives here from Google because of that phrase, sorry there aren’t any photos here) writhing around on stage as the new born creature. From here onwards the plot whilst streamlined sticks fairly close to the book. The performances from the two leads are excellent, especially Cumberbatch’s twitchy creature. Miller is slightly less convincing as Victor switches between guilt and arrogance, but holds his own in the set pieces between the two. The supporting cast keep things ticking along nicely with the exception of George Harris as Victor’s father who gives a rather oddly mannered performance. The set makes full use of the Olivier’s facilities which is nice as the last few plays I’ve seen here have been a little static. There’s a large church bell suspended in the middle of the audience that gets rung, loudly, at various points, guess where we were sitting? Meanwhile, there was a bit of celeb spotting in the audience: Simon Callow, David Walliams (he was at school a couple of years above me), Graham Norton and someone else who we both recognised but haven’t been able to put a name to. We think he wasn’t Iain Glenn but looks a bit like a slightly younger version of him; any guesses? Posted on February 24th 2011 at 9:19pm in Doctor Who, My Life. 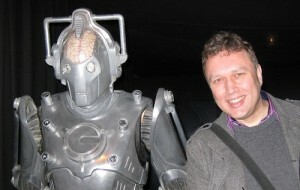 Today I went to the new Doctor Who Experience at Olympia. It’s a two part exhibition, starting with an interactive walkthrough and then a more normal array of props and costumes to gawp at. After being swallowed by a crack in time we’re taken to a museum on Starship UK (crammed full of all sorts of props – I spotted the ‘Schlechter Wolf’ bomb, a life belt from the SS Bernice, Yeti control spheres and a Dalek trooper helmet as well as the headline items pointed out in the dialogue). Whilst in the museum the Doctor contacts us, in specially recorded Matt Smith video clips, and reveals that he’s been trapped in the Pandorica again and needs our help to escape. The TARDIS materialises and we (or rather any children in the group – once again, little blighters get all the best things) pilot it to the Doctor’s rescue. Until we crash on a Dalek ship. Ooops. Surrounded by new paradigm Daleks ready to exterminate us all. Rescue comes in the unlikely form of some old style Daleks – “The Children of Davros” – which may point at a new Dalek civil war in the forthcoming series. Out of the frying pan and into the fire as the escape from the Dalek ship takes us through a corridor (lots of corridors in this, which is very appropriate) containing Weeping Angels. Rushing onwards we reach the Pandorica itself and the Doctor does something sonic to teleport himself into the TARDIS. There’s a cool 3D sequence of Daleks, Cybermen and Angels flying at us from the time vortex before the Doctor saves the day. The second half is more conventional and packed with more goodies than any previous Doctor Who exhibit (certainly more than Earls Court a few years ago or Longleat a lot of years ago) – costumes from all eleven Doctors and all the twenty first century companions. 1980s and 2010 TARDIS exteriors, 1980s and 2005 TARDIS control rooms, six different models of Daleks from 1963 to 2010, three different Sontarans, the Giant Robot, the Face of Boe, and more and more. 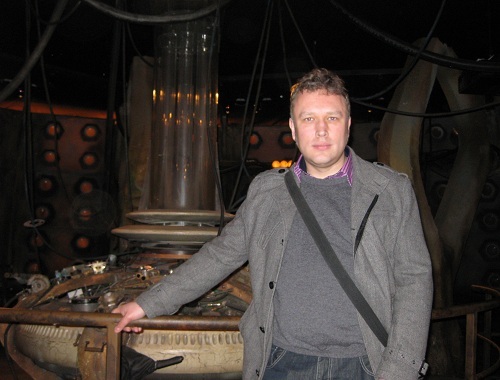 It’s not cheap, £20 for adult tickets and an eye watering £12 for a photo of yourself in the Pandorica chair (I passed on that), but if you’re as much of a Doctor Who fan as me you’ll love every moment of it. Posted on February 7th 2011 at 3:56pm in WWW. I’m late to the party as usual, but here’s my summary and opinions of the recent fuss over what is and isn’t HTML5. A label (analogous to DHTML or Web 2.0) for a group of new web technologies, including the standard referred to above but also CSS3, SVG and other technologies. So that’s one precise, technical meaning, and one vague, fuzzy meaning. If you’re talking to developers, web designers, browser manufacturers or CTOs you use the first meaning; if you’re talking to marketing types or CEOs you use the second. If you’re talking to a mixed audience you need to clarify what you mean. It’s not ideal but it’s not the end of the world. The W3C produced a new logo as part of their effort to promote HTML5. This was marketing activity and the usage seemed to be close to the second meaning above. However, this is the W3C and their core audience is technical and hence expected the first meaning. Some fuss and a few edits to the FAQs later and the situation was clarified. Meanwhile the WHATWG have decided that from now on they are working on the living standard of HTML and that version numbers are passé. This actually makes a lot of sense. Browsers don’t implement versions of HTML, they implement a hodge podge of features that appeal to them. Most web sites are thus created based on what works on browsers. When we say that we’re building a site in XHTML 1 and CSS 2.1 we mean the subset of those features that are both useful for the site in question and supported by IE7, etc. But developing (a site, an API or a browser) to a moving target is difficult and troublesome. Having a standardised version of the spec is useful, it means that my example site using that subset of XHTML 1 can be checked against that standard today, tomorrow and five years from now. The good news is that there’s no longer two HTML5 standards to cause confusion. Now there’s HTML at WHATWG – an iterative, ever evolving specification that acts as an ideas generator and prototype for the future of the web, and there’s also HTML5 (and maybe one day 6, 7, etc.) at the W3C – a slice of the living standard, reviewed, refined and eventually set in stone as a standard. I’ve been using parts of HTML5 for over a year now – I’m using a fairly safe subset of features (and <hgroup> which some people seem to have a problem with and want to remove or change) and can refer to the W3C spec for details whilst keeping one eye on the WHATWG for future developments. This seems like a sane approach for most front end developers – there’s a lot of exciting changes coming out and only a few people will have the time and resources to keep on top of all of them. Posted on December 30th 2010 at 2:36pm in Books, Memes, My Life. Last year I said “I think 2010 may be slightly less weighted towards graphic novels”. Whoops. How many of my 2010 books have you read? Posted on December 23rd 2010 at 12:29pm in The World. As asked for it, here is my theory on clothes. Clothes fall into two categories. Those that generate fluff and those that attract fluff. The only way to maintain sanity is to maintain two separate wardrobes, two separate laundry baskets, two separate washing machines and even two separate irons and ironing boards. Every day has to be either a fluffy day or a non-fluffy day. Only with this level of discipline can the fluff generating clothes be kept away from the fluff attracting clothes. Something to think about when contemplating your Christmas jumper.